When Surfwriter.net was launched in February 2002 I was hoping to entertain a few web-surfers and re-establish contact with some of the old crew. Since then, the site has welcomed over five million visitors and not only have I got back in touch with several of my old mates, I've met some exceptional people and made some new friends along the way. So it's all been worth it. The site has grown over the past nine years and will continue to evolve. I've been adding more of my own work plus some great stories, memories and photos from other contributors - and there's more to come. So thank you for your support and check back from time to time for new additions. SHORTLY BEFORE CHRISTMAS 2017 a hacker managed to infiltrate my account and take down this site. Since this has happened before with my Facebook account and those of friends, we are thinking the same person is responsible and that - as puerile and spiteful as it sounds - it is part of a malicious and small-minded attempt to stop the 10th Life Of Da Cat project to establish an online history of Miki Dora, his surfing, his times and his legacy. We've now taken steps to insure we can trace the source of the hacking should another attempt be made and will take legal action. As Dylan sang: The times they are changin'. Capice? Bob Feigel grew up in Santa Monica and Malibu, California where he learned to mat-surf in front of his mother and step-father's weekend beach house near Big Rock in the late-forties. He started bodysurfing in the early-fifities and boardsurfing in the late-fifties. In the early-sixties he managed the Makaha Skateboard Exhibition team, worked for the legendary Surfguide Magazine and wrote a regular feature called Feigel Fables. He also contributed articles and celebrity interviews to a number of other magazines, worked in radio and television, and was editor of Young American Report. After living in Malibu, on Maui, Hawaii and in Costa Rica, Bob moved to Aotearoa New Zealand in 1974. Since then he's worked as a radio producer, scriptwriter, screenwriter, feature writer, editor, copywriter, agency creative director and was New Zealand correspondent for NBC News. His 1989 book of ‘black humor’, The Senior Citizen’s Survival Guide, enjoyed five print runs and a revised, expanded edition was re-published in New Zealand, Australia and the UK in 1997. In 2003 there was another NZ-Australia print run and the US edition was re-released - available online from AMAZON and Barnes & Noble. Bob is a longtime member of the Malibu Surfing Association, a former member of the board of directors of the United States Surfing Association, a senior editor of H2O magazine and a former senior editor and New Zealand correspondent for Pacific Longboarder magazine. He is also a former member of AFTRA (American Federation of Television and Radio Artists), the New Zealand Institute of Management and the New Zealand Writer's Guild (PEN). the man who invented the modern skateboard. 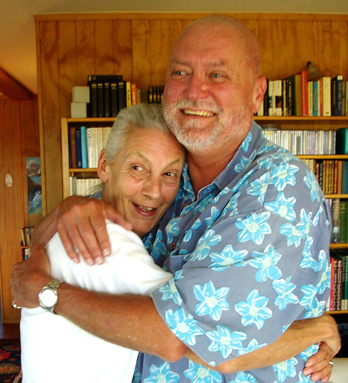 He lives with his wife, Anne, on a hill above Matapouri Bay, on the North Island's northeast coast and is working on two books: Path of the Healer with Gregor Robinson; and A Deal With God with Steve Lyon. This modest website would not have got off the ground without the inspiration of Tom McBride's classic, long established website: http://www.atomicbride.com. Tom's site provides surfers and researches with a remarkable resource, including archival photos, historical references, stories, reminiscences and an ongoing exchange between surfer's from those 'Golden Years'. I visit it often and recommend it to anyone who wants to enjoy a real blast from the past. As someone who was brought up with the ocean as my playground, I've learned that the 'spirit' of surfing expresses itself in many ways - as any dolphin, sea otter, seal or human surfer can tell you. In human terms, it includes board surfing, body surfing, boogie & body boarding, wind & kitesurfing, kayak & canoe surfing, and so on, ad infinitum.